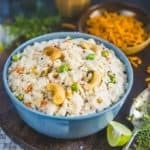 Upma is a delectable South Indian breakfast dish. Rava Upma is made by continuously stirring roasted semolina (Sooji) with spices, veggies, green chillies and curry leaves on a medium flame with hot water. Heat 1 tsp ghee in a pan. Add rava and fry until turns slightly brown. Remove the roasted rava on a plate and keep aside. Heat the remaining ghee in the same pan. Once the ghee is hot, add mustard seeds, curry leaves, urad dal, chana dal and cashew nuts and fry until they turn slightly browned. Add onion, green chilli and ginger and fry until onion turns pinkish in colour. Add carrots and peas and cook on high heat for 3-4 minutes. Add hot water, salt, sugar and lemon juice and bring it to a boil. Add the roasted rava and mix well. Cover the pan and simmer the heat to low. Cook for 3-4 minutes on low heat until rava absorbed the water and is cooked. Remove the pan from heat and let the upma rest for 4-5 minutes. Fluff it with a soon and serve hot. Enjoy cooking Rava Upma from WhiskAffair. Try more authentic tried & tested recipes from https://www.whiskaffair.com.